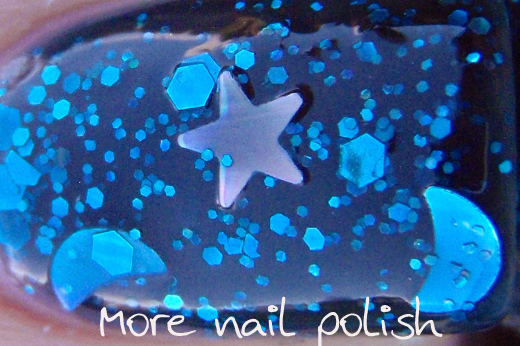 I got some new solvent stable glitters the other day and decided it was time to make up some new custom polishes. 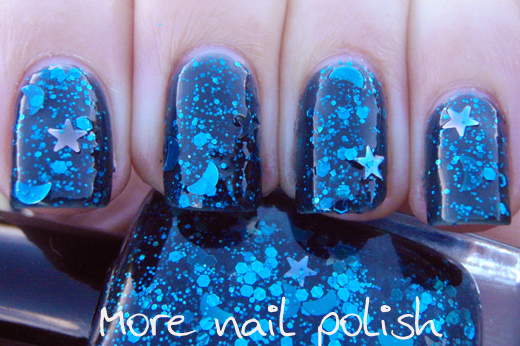 Here is the first polish I made up, which I have called 'My moon and stars'. It has small and medium sized turquoise hexes as well as turquoise holo moons and silver stars. The base is a dark blue jelly which is made with suspension base, a few drops of Blue 1 tint concentrate, two drops of Ferric Ferrocyanide tint concentrate and one tiny drop of black tint concentrate. 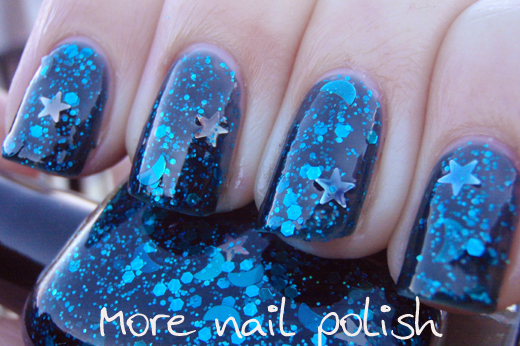 This is two coats on its own, and while it might look like the edges of the stars are sticking up, they are actually smooth beneath the glossy top coat of Ulta3 non-chip x2 and Seche Vite. I have a whole range of other franken polishes / custom polishes in mind, I just need the time to make them and wear them. Our Aussie supplier for suspension base (or untinted lacquer base as they call it) has recently set up a section on their website with all their franken supplies listed. The suspension base they sell is really fantastic, it suspends glitter really well, dries glossy and is big 3 free. I'm a huge fan of it and have personally used more than a litre of the stuff for just my own mixing. I also highly recommend their tint concentrates. I purchased some of every colour and they make the most amazing jelly colours. They do ship overseas, but only items that are not classed as dangerous good such as glitter and the like, so please don't ask them about shipping suspension base overseas. Across the universe on speed! That looks AMAZING! 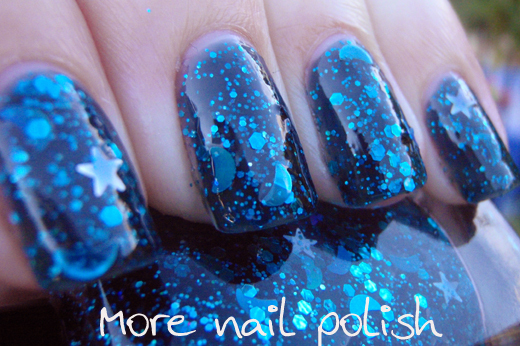 I'm usually not a fan of glitters like this but it all works so perfectly together! This is gorgeous, I've had the same idea in mind but in pink, and I am awaiting my order of base to begin experimenting, thank you!!!! Would you consider, for a fee, making a bottle of that for a fellow Canberran? The polish is drop dead gorgeous. Absolutely - Whoo hoo, another Canberra nail girl! Send me an email Pia! Gorgeous! I wish this kind of store were available in the UK!! 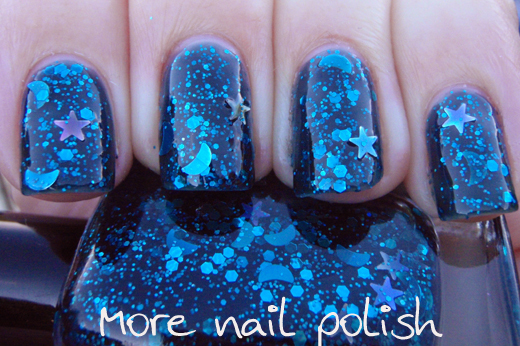 :-O I love this, moons and stars are just so perfect! So pretty! The moons are stars are awesome in this!! It looks no less than fantastic!! This is obscenely beautiful! Of course I'm a sucker for blue and celestial things so I may be biased. Ohh, I love it! Thanks for the tip on where to get suspension base. I have been lusting after some for awhile now! Thank for sharing the web link. I love your glitter polish too.